Our client is a software company in Sandy Springs which makes innovative products for the automotive industry. They are looking for mid-level front-end developers to help build a new product using React and Redux. 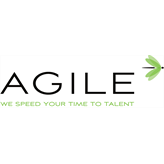 Want to get notified about new jobs at Agile Resources?